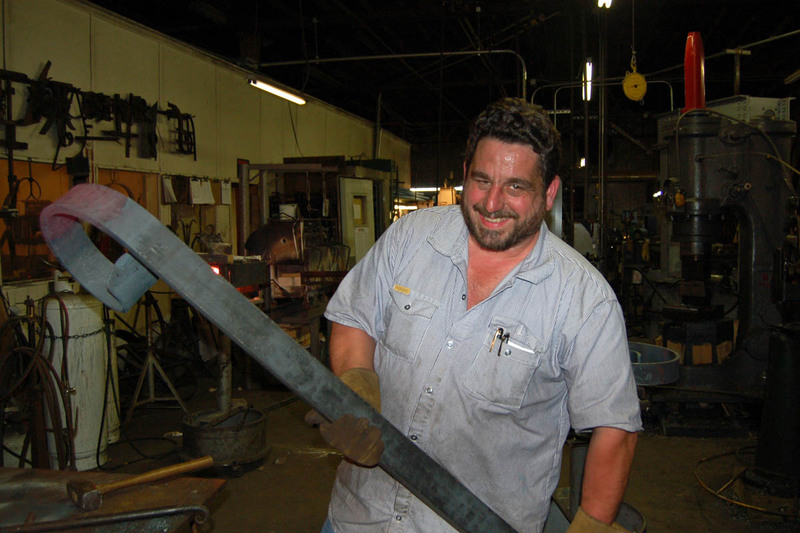 Phillips Metal Works is an ironworks shop specializing in hand forged ironwork. Our shop is staffed by meticulous craftsmen with many decades of design and iron working experience. 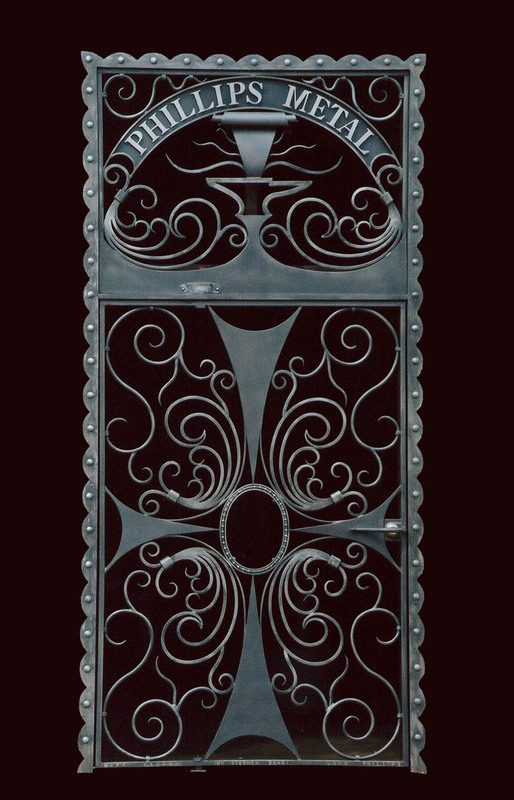 Combining traditional blacksmithing techniques with contemporary methods allow us to create architectural and sculptural elements that preserve the personal and fluid nature of hand hammered iron while producing current designs. In our quest to produce our brand of ironwork, we have combed the hills for equipment old and new. The Southwark Press was rescued from a foundry less than a mile from our shop. It was made sometime before 1900 and at some point the hydraulic pump was converted from the push arm pump driven by an overhead line shaft to a modern self-contained unit. We converted the leather packed seal to a contemporary seal and replaced ground shaft with a polished shaft. At full power the press produces 100 tons of pressure. The 1500 pound cast iron table is perfect for holding tooling of all shapes and sizes. 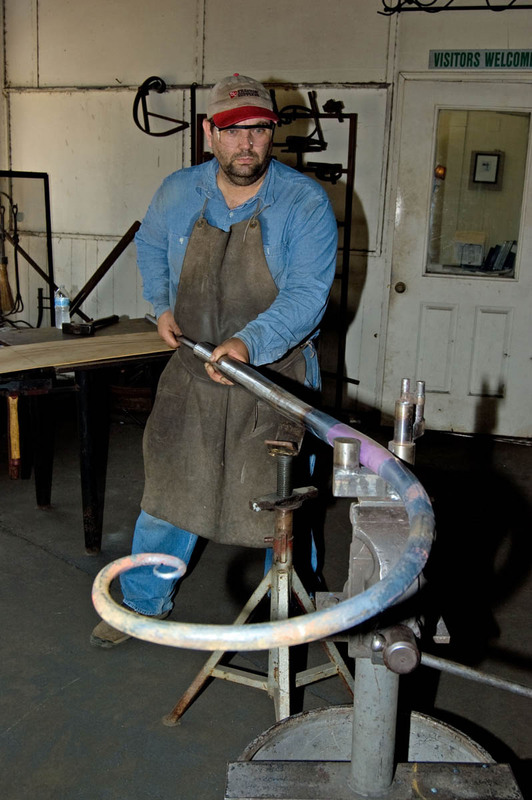 Our press was featured in Randy McDaniel’s book Hydraulic Forging Press for the Blacksmith. The Nazel 3B power hammer was built in 1913. It was removed from decades of service in a Midwest factory where it produced trowels for masons. It found its way to Wisconsin where renowned restoration expert Bob Bergman worked his magic on it. This hammer is the Cadillac in the blacksmith world. At full power it hits the hot steel with a 300 pound blow, 180 times a minute. But its real magic lies in its precision valving and 10,000 pounds of mass that give it the finest control imaginable for those light touches. The Little Giant Trip Hammer was delivered to a farmer in Kansas in April of 1912 from the Little Giant factory. It came from the factory with a set of combination dies made for sharpening plow shares and the tattered remains were still on the hammer when I found it in Florida. After an extensive renovation the Little Giant is a mechanical marvel and a blast as it clatters and slaps the hot iron into shape. 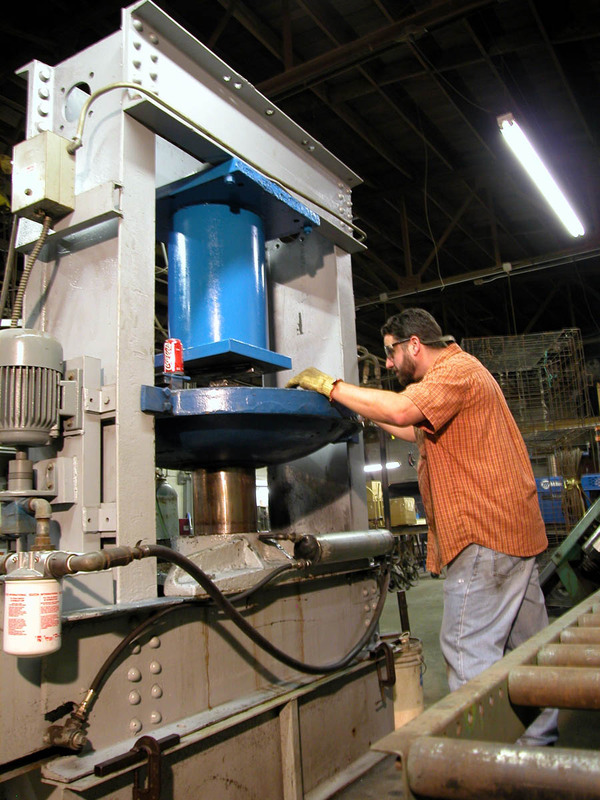 Our WWII era machining equipment is still used heavily every day. 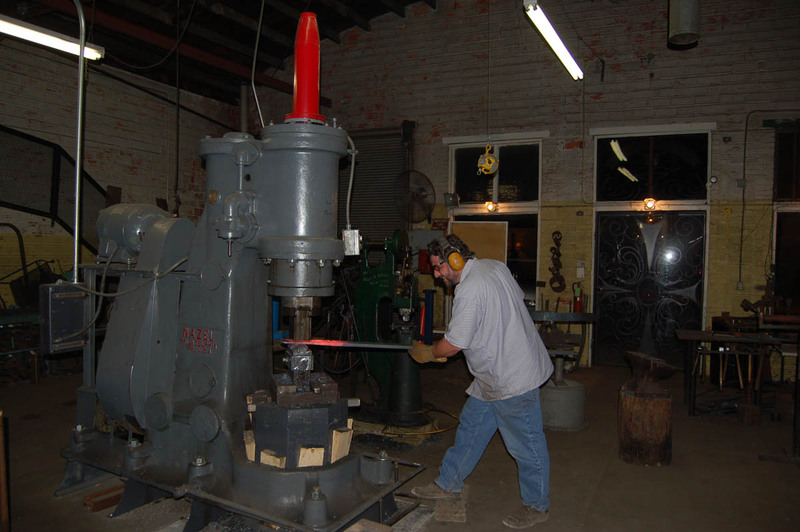 The specialty lathe and large drill press under skilled hands of our old school machinist form parts from drapery hardware to large commissions. Fast forwarding to modern day finds our welding and painting equipment. Aerospace quality TIG welders and large capacity MIG welders give us the capacity to produce the highest quality ironwork. German made HVLP paint guns and a new self-contained gun cleaner help us with a high quality paint job in an environmentally friendly manner. We employ CAD drawing for some project development and outsourcing laser and water jet cutting parts. We also have access to powder coat painting for outside projects like our mailboxes. For outside installation of custom architectural and sculptural projects we designed and built a mobile shop, powered by a diesel welder that is strong and quiet. This allows us to show up onsite with everything ready to go. The heart of our shop is the people. 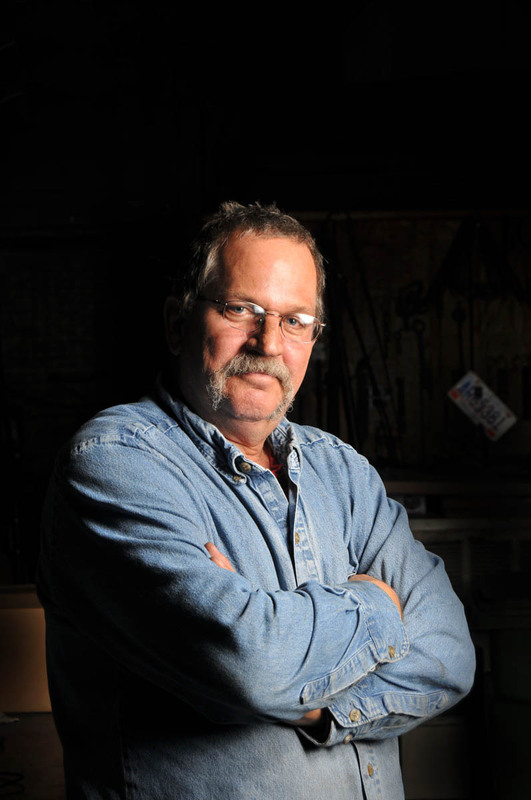 Mark Vaughn got his start with steel in the shipyards of Newport News, Virginia. From there he ended up as the fabricator for the local board of education. He joined the shop in 2000 working evenings until he retired and came on board full time. Mark is a highly respected fabricator and his signature is on nearly every project that leaves our shop. Jim Marrer’s machinist career took an early detour into the music business until 2004 when he returned to the lathe at Phillips Metal Works. He is a meticulous machinist with a highly inventive side. Jim also brings his technical skills from the recording studio into the lighting arena. 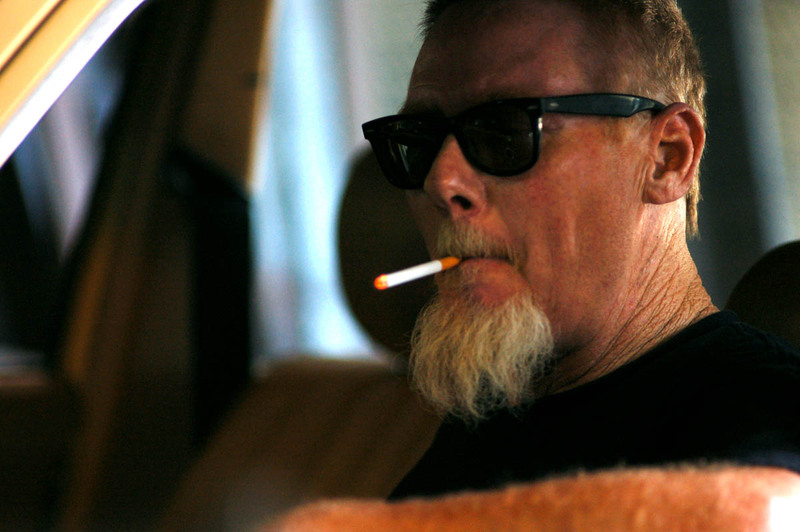 Jamie Blackburn’s arrival at the shop was a true trial by fire. He started in July of 2009, a remarkably cruel Alabama summer, a month that was only topped by the savage heat of August. Thankfully he hung tough and his 20 years of industrial machine shop experience and a blacksmithing background have been a huge plus. Jamie does the forging as well as overseeing the flow of many projects and managing shop activities. His technical experience and steady hand are a big part of our success. My inspiration for architectural metalwork comes from my fascination with the historic European craftsmen who transformed raw bars of iron into breath taking architecture for royalty, protective suits for their knights and tools for the working people. The fluidity, personal nature and mystical properties of this ironwork are the qualities that I attempt to capture in my works. A dog is an important fixture in any real blacksmith shop. They fill out a significant part of a shop's personality and in that respect Caleb excelled at his duties. Caleb could bring a smile to my face in the toughest of times, always greeted visitors with a smile and a slobbery toy and was as much a part of our shop as the anvils and hammers. He grew up in the shop from the sickly, puny little 6 week old puppy who was rescued from a terrible puppy mill to a giant personality that quickly became the face of the shop. Caleb’s sweet personality and his stubborn will to survive carried him through a complete regiment of chemotherapy at the Auburn vet school in 2005 and the doctors were optimistic that with his drive he would exceed the norms and stay in remission for a couple of happy and healthy years. They are still talking about how he made it for more than 7. I think that although the McDonalds french fries may be killing us, our regular stops at the exit 52 McDonalds were key to his longevity and at least had a powerful tail wag factor to them. Caleb started slowing down a few years ago and started spending more time in my chair at home than he did in the shop but he still had one more important challenge. When I hit a medical low earlier this year, Caleb became the cheerleader through my treatments and really shined. As I got better, he slowed down. Caleb may be gone but his paw print has left a big impression on our little shop. He will be missed.